Poll: Will you be taking part in Wednesday's anti-water charge protest? Attendance is predicted to match, if not exceed, previous protests. 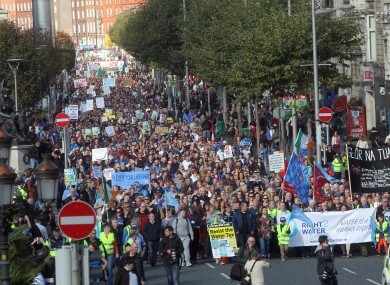 AS MANY AS 100,000 people are predicted to attend Wednesday’s anti-water charge demonstration in Dublin. Some have even flown in from Detroit. However, the timing of the event, being a weekday rather than weekend, has raised questions over whether attendance will match previous marches. Some have suggested that it could become a day of national strike. What are your plans: Will you be taking part in Wednesday’s anti-water charge protest? Email “Poll: Will you be taking part in Wednesday's anti-water charge protest?”. Feedback on “Poll: Will you be taking part in Wednesday's anti-water charge protest?”.